Eurasylum Ltd. is a fully independent research and consulting company that was established in 2001 in the United Kingdom. It conducts policy research, evaluation and technical cooperation activities dedicated solely to issues of immigration control and border management (including biometrics), visa policy, labour migration, asylum and refugee law and policy, IDPs, integration policies, migration and development, and trafficking in human beings, in Europe and internationally. Eurasylum’s services are targeted primarily at relevant national Government agencies, the European Commission, the European Parliament, other EU institutions and relevant international organisations. A selection of recent and on-going research, evaluation and consulting projects implemented by Eurasylum can be viewed here. Eurasylum’s staff include a mix of former senior Government officials, experienced researchers and specialised consultants of various nationalities. 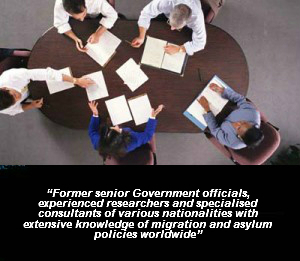 They can all demonstrate extensive experience of devising, implementing, researching or evaluating migration and asylum policies and programmes in a wide range of countries, and in a large variety of contexts, including both in the public and private sectors, and in academia.